Papa Painguins are enemies appearing in Donkey Kong Country: Tropical Freeze. They are penguin-like members of the Snowmads which wear green trousers, a viking helmet, and carry a dead fish. Papa Painguins seem to be a mixture between Pointy Tucks and Painguin Tucks due to the fact that they use both dead fish as a spear and wear a spiky helmet. As a result, they use them as a defense from the front and the back. 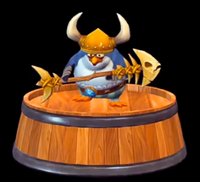 However, Papa Painguins can be stunned by a Ground Pound and then defeated by a Roll attack. This page was last edited on August 31, 2018, at 10:52.